You boys have no idea how much I blame myself for last year. There were two moments that summed up the fortunes of Geelong in the 2008 and 2009 Grand Finals. And there was one player who was central to both moments - Cameron Mooney. One of the notable facts of the 2008 Grand Final was that the Hawthorn defence purposefully rushed 11 behinds. This tactic largely contributed to the introduction of the deliberate rushed behind rule for the following season. The focus on the rushed behinds perhaps masked the fact that Geelong’s goal kicking was terrible that day. In the second quarter, when Geelong largely controlled the play, the Cats scored 1 goal and 9 behinds, of which only 2 were rushed. The misses were a combination of poor execution and poor discipline (i.e. not passing to a player in a better position). But there was one shot at goal, in the last play of the quarter, that stood out above the rest. With 13 seconds left on the clock before half-time, Cameron Mooney marked the ball just outside the goal square. Although forced onto the angle, the goal should have been a formality. The siren sounded. A goal would have put Geelong in front and provided them with the momentum heading into the half-time break. With confidence high and recognizing the psychological significance of scoring the goal, Mooney had a plan. Enright marked the ball on the black flank. He passed to Johnson, who had hardly had a kick all day. Inexplicably, Ablett was loose in the centre. Johnson spotted him. Mooney, thinking Ablett would take the ball, turned and ran towards goal. But his St Kilda opponent Zac Dawson charged in the other direction. There was nothing between Ablett and the goals. Dawson had to stop Ablett. Johnson’s pass seemed good, but at the last moment it hung in the air, giving Dawson just enough time to get a fist on it and spoil. For an instant Ablett looked bewildered. Watching from afar, Mooney was in despair. Now the St Kilda forward line was wide open. If Dawson gathered the ball, the game could be over. Mooney thought he was about to cost Geelong two premierships. But Dawson could not pick it up. The ball spilt forward. Coming the other way were St Kilda’s Justin Koschitzke and Scarlett, with Scarlett just ahead and the ball at his feet. Football, Thompson always said, is a game of decision-making. If Scarlett had picked up the ball Koschitzke would have been on top of him. Instead, he got a foot to it and caressed it into Ablett’s arms. It would become known as the toe-poke, and would never be forgotten. Ablett turned, he was clear, and gone. Ablett could have run close enough to goal to score but when he heard Scarlett running behind him, urging him on, he thought it was a St Kilda player and kicked. The ball floated long and high to the top of the goal square. As Mooney ran, Rooke was running to the same spot. Five players flew. ‘As much as I love Rookey I cracked the shits with him, he spoiled me, smashed into us,’ Mooney says. Rooke disagrees. His opponent Sam Fisher was in a prime position to mark; he had to stop him. Byrnes was also in that clutch of players, and he also thought he was going to pick it up: ‘Steven Baker was right on my hammer. I flicked it to Trav [Varcoe], he was right at the top of the square.’ Varcoe handballed to Chapman, who turned on his tank-like frame and kicked. The ball floated high in the air, hovered for an instant, then went through the goals. A few minutes later, Geelong were Premiers. There was one other notable fact about Cameron Mooney in the 2009 Grand Final – it was his birthday. In fact Mooney is the only player that has celebrated both a birthday and a premiership on the same day for over 20 years. This may seem like a trivial fact and it probably is, as I doubt it had little effect on how he played on the day. But it does prompt the broader question – for AFL players, does it matter what day they were born in the year? 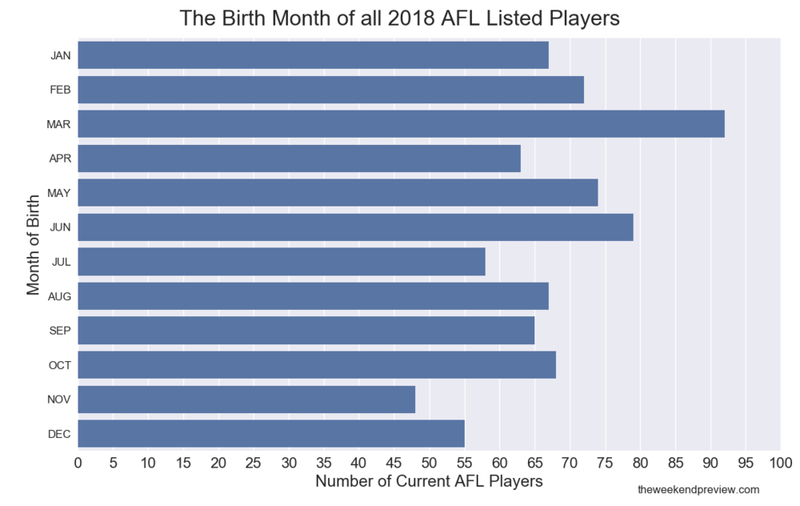 To answer that question lets look at all AFL listed players for the 2018 season and categorise them by the month they were born, with the result presented in Figure-2. The most striking feature of the graph is the dominance of players born in the month of March. On even further examination, it is clearly evident that a greater proportion of players are born in the first half of the year, with a gradual decline towards the latter months of the year. This being Canada, the most ice hockey-crazed country on earth, coaches start to select players for the travelling rep squad – the all-star teams – at the age of nine or ten, and of course they are more likely to view as talented the bigger and more coordinated players, who have had the benefit of critical extra months of maturity. And what happens when a player gets chosen for a rep squad? He gets better coaching, and his teammates are better, and he plays fifty or seventy-five games a season instead of 20 games a season… By the age of thirteen or fourteen, with the benefit of better coaching and all that extra practice under his belt, he’s the one more likely to make it to the Major Junior A League, and from there into the big leagues. This all contributes to the concept of the Talent Myth, which argues that it is opportunity and purposeful practice (i.e. the 10,000 hour rule) that are the dominant contributors to future success. Although the theory appears sound, are players in AFL youth (e.g. under 12’s) representative squads really gaining such an opportunity and coaching advantage above the remainder of the population? Some skepticism remains. Reverting back to Figure-2, have we missed the obvious question? What if simply more kids in the general population were born in March and conversely fewer kids were born in November/December. AFL players listed in 2018 were born in the year range 1982-1999. Statistics for these years were not readily available. However, data from the Bureau of Statistics for years between 2007 and 2016 can provide some intriguing insights . Figure-3 presents the number of births categorised by month as a percentage difference from the average for that decade period. Assuming the common trend can be extrapolated back for the preceding 2 decades then there are some notable consistencies, particularly the sharp drop-off in births in November and December. Figure-3: The number of births categorized by month as a percentage difference from the average for the period 2007-2016. Using this above information, Figure-4 presents a comparison of the expected and actual number of player birthdays per month. There is now some justification for some of the trends in the data. However, in the first half of the year, birthdays in March, May and June in particular are still trending well above expectation. And conversely, in the second half of the year, birthdays in July, November and December remain well below expectation. So there may still be some truth that football players born early in the calendar year are gaining a greater opportunity to make it to the top level of the sport. For whatever reason that may be. St Kilda are in crisis mode after consecutive poor losses. Geelong have been competitive in all three of their matches, but if not for Max Gawn's wayward kick in Round 1, the Cats could easily be 0-3. So although Geelong start warm favourites, the depth and inexperience of their team (6 players named with under 20 games of experience) would suggest some variability in their performance should be expected. It's hard to tip against Geelong at home, but the game may be closer than we might think. Button, J. (2016). “Comeback”. Melbourne University Press, VIC, Australia. Gladwell, M. (2008). “Outliers: The Story of Success”. Little, Brown and Company, USA.